The main purpose of this research work was to improve the dissolution rate of poorly soluble drug i.e., Gliclazide by formulating complexation with Cyclodextrins in 1:1, 1:2 and 1:3 ratios. 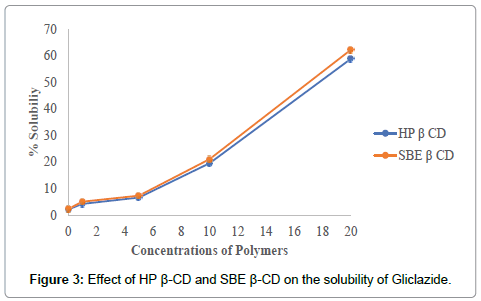 These Complexation with HP-β-CD and SBE-β-CD were prepared by solvent evaporation method and this prepared complex was subjected for Phase solubility studies, which is characterized by XRD and FT-IR studies. XRD studies revealed that the crystal nature of drug has been transformed to amorphous after preparing complexation. FT-IR studies reported no interactions. Best formulation (Gliclazide, SBE-β-CD complex in 1:2 ratio) was selected based on Phase solubility studies and Gliclazide tablets was developed with polymers Hydroxy propyl methylcellulose K-100M, Hydroxypropylcellulose-EXF. Tablets were subjected to various pre-formulation and post formulation studies. The evaluation of tablet batches i.e., Hardness, Friability, drug content and invitro drug release studies have been studied after the evaluation of all batches, F16 batch shows best release for 12 hours. These optimized formulation was compared against marketed product. Further can be concluded that dissolution rate of Gliclazide could be enhanced by tablets containing complex of SBE-β-CD. 2) Subsequent solubilization of drug particles in physiological fluid. As the process of dissolution is a rate limiting process for undertaking further absorption in to the body. So, it has become a major difficulty in case of poorly water soluble drugs that have low solubility and high permeability i.e., BCS class II drugs, it is possible to enhance their dissolution rate and bioavailability. Many attempts and approaches were initiated on the improvement of dissolution rate of poorly soluble drugs, among which complexation technique was successful. Chemically Gliclazide is 1-(3,3a,4,5,6,6a-hexahydro- 1H-cyclopenta[c]pyrrol-2-yl)-3-(4-methylphenyl)sulfonylurea. It is a second-generation hypoglycemic sulphonyl urea which is useful in the treatment of Type II (non-insulin dependent) diabetes mellitus. Gliclazide is white crystalline powder, relatively insoluble in water. Thus, due to its characteristics the gastrointestinal absorption of Gliclazide is slow and has less bioavailability, also has a half-life is about 10 hours. So Gliclazide is one among the poorly soluble drug thus attempts are made for enhancing its bioavailability and therapeutic efficacy. In the present work complexation was prepared by solvent evaporation method. To enhance the dissolution rate of poorly water soluble Gliclazide drug. Complexation of drug is prepared with HP β-CD, SBE β-CD by solvent evaporation technique [1-4]. Gliclazide was procured from Pulse Pharmaceuticals Private Limited as a Gift sample. The Cyclodextrin SBE β-CD was procured from CyDex Pharmaceuticals, lnc. and all other ingredients used were procured from college source . Characterization and identification of drug: Pure drug GLZ was characterized and identified by organoleptic properties, physical nature melting point and solubility (Table 1). Table 1: Preformulation studies of Drug. Solubility of gliclazide: Solubility study was conducted to determine the effect of different buffers on the drug. An excess amount of drug was dispersed in 5 ml of distilled water, methanol, acetone, Phosphate buffer solution (pH 6.8 and 7.4), 0.1N HCl, in glass stoppered tubes respectively, all the glass tubes were closed with stopper and covered with cellophane membrane to avoid solvent loss. Tubes were kept in water bath shaker at 37°C for 24 hrs. As the samples attain equilibrium, they were subjected for centrifugation at 3000 RPM for about 5 minutes. After completion of centrifugation the samples get separated, then supernatant liquid is filtered through membrane filter and then analyzed by UV spectrophotometer at 230 nm respectively [6-9]. Phase solubility studies: Phase solubility studies were performed according to the higuchi and Connors method. In this method excess amount of drug was taken in 50 mL flasks that contain different concentrations of HP β-CD and SBE β-CD in distilled water then the flasks were stoppered respectively. The stoppered conical flasks are subjected to shaking in a rotary shaker for about 48 hrs. at room temperature. Then the samples are withdrawn after reaching equilibrium and filtered using whattman filter paper. The filtered samples were analyzed by UV spectrophotometer at 230 nm. This process was repeated 3 times and apparent solubility constant is calculated from phase diagram (Table 2). Table 2: Preparation of Gliclazide Cyclodextrins complex. Solvent evaporation method: In this method, accurately weighed quantities of HP β-CD and SBE β-CD in stated proportions were transferred into test tubes and dissolved in acetone. To the prepared solutions accurate weighed quantities of drug were added and allowed to dissolve. The solutions prepared are transferred into petridish and subjected to evaporation at room temperature. The obtained dispersions were dried at room temperature for 1 hour. The obtained mass was crushed, pulverized and sifted through #100 Mesh. FTIR: FTIR Spectra were obtained by using an FTIR Spectrophotometer. The samples are ground and mixed with potassium bromide, an infrared transparent matrix, at 1:5 (Sample: KBr). The KBr discs were prepared by compressing the powders by maintaining the pressure of 5 tons for 5 minutes in a hydraulic press. X-Ray diffraction: The X-Ray diffraction patterns were obtained at room temperature using X-Ray diffractometer with cu as anode material and graphite monochromatic, operated at voltage of 35 KY, current 20 mA. The samples were analyzed in the 2θ angle range of 10°-80°. Invitro dissolution studies of complexations: Basket type dissolution test apparatus is used to carry out Invitro release studies. Release studies were carried out separately for the pure drug, inclusion complexes of Gliclazide. Dissolution was carried out in 900 mL of pH 6.8 with a stirring speed of 75 RPM at a temperature of 37±0.5°C. 5 ml aliquots of dissolution medium were withdrawn at an interval of 5 minutes and filtered through 0.45 μm filter. The equal volume withdrawn from dissolution medium was replaced. The absorbance of the suitable diluted solutions was measured at 230 nm. The dissolution experiments were conducted in triplicates. Preparation of gliclazide tablets with gliclazide complexation: Wet granulation method is used to prepare Gliclazide tablets. The weighed quantities of Gliclazide SBE-β-CD complex, MCC, HPMC K-100M, HPC EXF were sifted through #20 sieve. Povidone is weighed and dissolved in required quantity of water, kept for stirring still clear solution forms. This granulation fluid was added to above blend to get lumps, the lumps were passed through sieve no 12 to get granules. These granules were dried at 60°C for 2-4 hours in an oven until they dry. Magnesium stearate is added to dried granules and passed through sieve no 14. These granules were punched in to tablets by using 9 station rotary tablet punching machine. Precompression parameters: Prior to compression granules were evaluated for their characteristic precompression parameters, such as bulk density, tapped density, Hausner ratio, car’s compressibility index and angle of repose . Thickness: Ten tablets were selected randomly picked from all formulations and thickness was measured by using Vernier caliper and average thickness was calculated. Weight variation:Twenty Tablets were randomly collected during compression of all formulations, weighed collectively and individually. From the collective weight, average weight was calculated. The percent weight variation was calculated by using the following formula . Hardness: Ten tablets from each formulations were taken and their hardness was measured by Monsanto hardness tester. The hardness was measured in terms of kg/cm2. Estimation of drug content in tablets: Ten tablets were accurately weighed and powdered. Tablets powder equivalent to 60 mg of the drug was taken for assay into 25 mL volumetric flask and 20 ml of methanol were added. The mixture was shaken thoroughly for about 30 min. to extract Gliclazide. The solution was then made up to volume with methanol. The methanolic solution was subsequently diluted suitably with phosphate buffer of pH 6.8 and assayed for Gliclazide at 230 nm. Gliclazide content of the tablets was calculated using the calibration curve (Figures 1 and 2). Figure 1: UV Absorbance Spectrum of Gliclazide API. 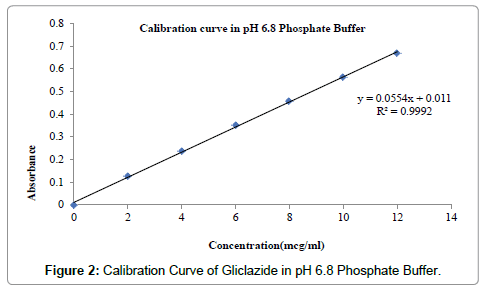 Figure 2: Calibration Curve of Gliclazide in pH 6.8 Phosphate Buffer. The Calibration of Gliclazide in Phosphate buffer pH 6.8 was carried out. Table 3 shows the concentration of Gliclazide in phosphate buffer pH 6.8 in the respective absorbance. Figure 2 shows the standard graph of Gliclazide in phosphate buffer pH 6.8 . The solubility increased linearly as a function of carrier concentration and the solubility curve can be classified as Higuchi’s type AL as shown in Figure 3. Figure 3: Effect of HP ÃÂ-CD and SBE ÃÂ-CD on the solubility of Gliclazide. FTIR: FTIR Spectrophotometric method was developed to establish the compatibility of Gliclazide complex and pure drug. Both the spectra were compared for confirmation of common peaks. Gliclazide showed no significant variation in height, intensity and position of peaks, suggesting that drug and recipients were compatible. Figures 4-6 shows interaction between drug and polymers. Hence it can be determined that the drug is in Free State and can be released easily [13-15]. 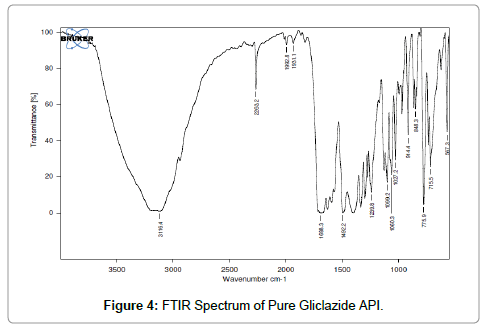 Figure 4: FTIR Spectrum of Pure Gliclazide API. 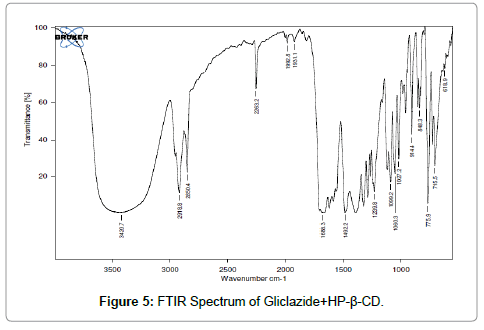 Figure 5: FTIR Spectrum of Gliclazide+HP-ÃÂ-CD. 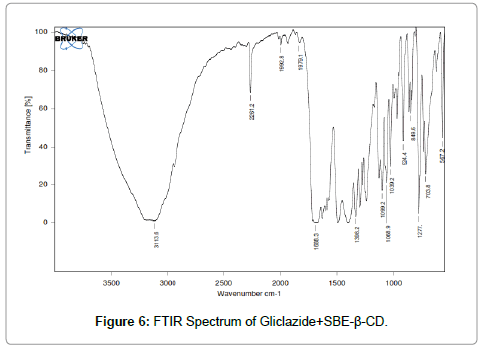 Figure 6: FTIR Spectrum of Gliclazide+SBE-ÃÂ-CD. XRD: X-ray powder diffraction was used to evaluate the crystalline state of different samples (Tables 4-6). Powder x-ray diffraction patterns of pure drug, complexes of Gliclazide with HP β-CD and SBE β-CD are shown in Figures 7-9. 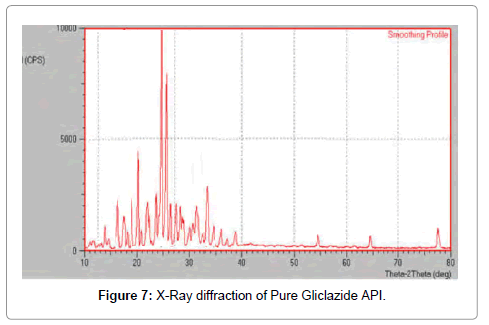 Figure 7: X-Ray diffraction of Pure Gliclazide API. Figure 8: X-Ray diffraction of Gliclazide+HP-ÃÂ-CD. 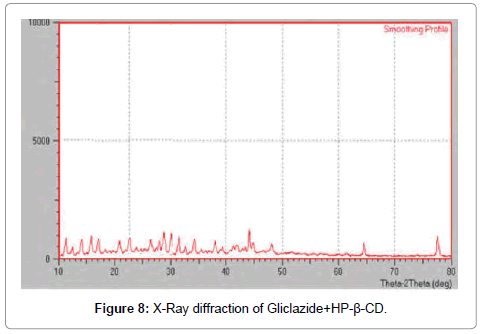 Figure 9: X-Ray diffraction of Gliclazide+HP-ÃÂ-CD. Table 6: Post Compression Parameters. The Post compression parameters of Gliclazide tablets are given in Table 7. Different formulations of Gliclazide tablets were evaluated for post compression parameters like Weight Variation or Average weight, Thickness, Hardness, Friability and Assay or Drug content with suitable methods (Figures 10-12). 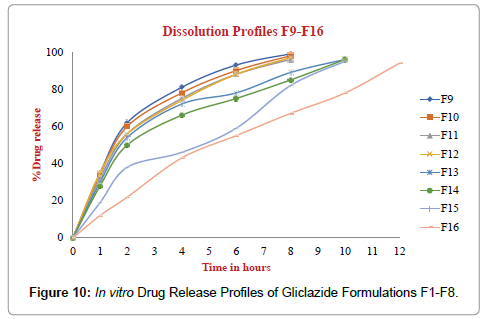 Figure 10: In vitro Drug Release Profiles of Gliclazide Formulations F1-F8. 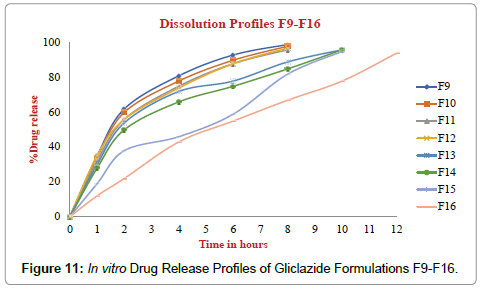 Figure 11: In vitro Drug Release Profiles of Gliclazide Formulations F9-F16. 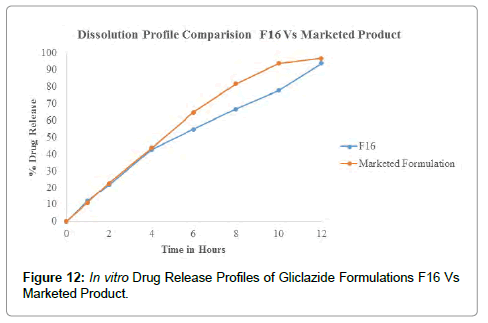 Figure 12: In vitro Drug Release Profiles of Gliclazide Formulations F16 Vs Marketed Product. Table 7: Assay Result of Marketed Formulation. The dissolution profiles of GLZ tablets as compared to marketed tablet dissolution studies were carried out in pH 6.8 Phosphate buffer, 900 mL, 75 RPM in USP-I (Basket Apparatus). In 12 hours the percentage of drug release F1 to F16 was incorporated in Table 8. The marketed tablets and Optimized formulation F16 drug release for 12 hours was incorporated in Table 9. Drug released at specific time periods was plotted on cumulative percent release versus time (in hrs) curves. Table 8: Dissolution Profile of Gliclazide Formulations (F1-F16). Table 9: Dissolution Profile Comparison of Formulation F16 Vs Marketed Product. Gliclazide is a poorly water soluble hypoglycemic agent exhibiting to some extent. In adequate and variable absorption as a consequence poor aqueous solubility and slow dissolution rates, Among the various approaches to improve the dissolution of poorly water-soluble drugs, the preparation complexation have been proven to be very successful. In this study HP β-CD and SBE β-CD was used in the preparation of complexation of Gliclazide to increase its dissolution. The formulations were prepared at different ratios of drug CD’s. Invitro dissolution studies have shown significant increase in the dissolution of Gliclazide when SBE β-CD (1:2) is used as carriers in the preparation of complexation. Based on Invitro dissolution performance, the complex of drug with SBE β-CD 1:2 was selected for formulation of tablets. 16 formulations were prepared by using various concentrations of HPMC K-100M, HPC EXF. The present investigations showed that dissolution of Gliclazide was markedly increased by complexation with Cyclodextrins as carriers. It was observed that he formulation (F16) containing Gliclazide+SBE β-CD, HPMC K-100M (31.92%) and HPC EXF (9.09%) shows highest extended dissolution rate in 12 hrs. Hence the complexation and polymers addition way is useful technique in providing enhanced dissolution rate as compared to plain Gliclazide. Loftsson T, Brewster ME (1996) Pharmaceutical applicants of cyclodextrins. J Pharm Sci, pp: 1024-1074. Sunil R (2012) Enhancement of solubility and dissolution of Gliclazide with HP ÃÂ-CD complexation. 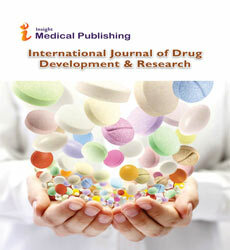 International Journal of Pharmaceutical Research and Development 4: 186-194. Anusha P, Asini P (2016) Formulation and evaluation of solid dispersions of glimepiride into sustained release. Global Journal of Pharmacy & Pharmaceutical Sciences 1: 001-005. Rajasree P, Behera SP (2011) Enhancement of solubility of gliclazide by solid dispersion. Int Pharm Tech Res 3: 1118-1124. Bhawandeep G (2010) Formulation & evaluation of glimepiride solid dispersion tablets. Asian Journal of Pharmaceutics 4: 212-218. Nagarajan K, Rao MG (2010) Formulation and dissolution studies of solid dispersions of nifedipine. Indian Journal of Novel Drug Delivery 2: 96-98. More CG, Dabhade PS (2015) Solubility and dissolution enhancement of gliclazide by solid dispersion technique 2: 51-58. Par KC, Lee BJ (2013) Current trends and future prospective of Solid dispersions containing poorly water soluble drugs. European Journal of Pharmaceutics and Biopharmaceutics 85: 799-813. 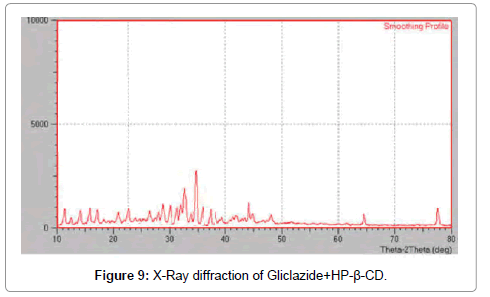 Deepak K, Narender S (2011) Enhancement of Dissolution profile of Gliclazide by Solid dispersion adsorbates. Lat Am J Pharm 30: 2057-2060. Biswas S, Sahoo J (2008) Enhancement of dissolution rate of gliclazide using solid dispersions with polyethylene glycol 6000. AAPS Pharm Sci Tech, p: 9. Leuner C, Dressman J (2000) Improving drug solubility for oral delivery using solid dispersion. Eur J Pharm Bio Pharm 50: 47-60. Khan CA, Rhodes CT (1975) The concept of dissolution efficiency. J Pharm Pharmacol 27: 48-49. Kavitha R, Sathali AH (2012) Enhancement of solubility Repaglinide by solid Dispersion Technique. 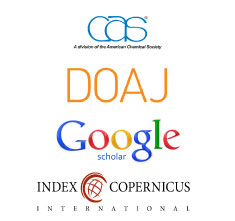 International Journal of Chemical Sciences 10: 377-390. Mudgal SS, Pancholi SS (2012) Formulation of glibenclamide solid dispersions by solvent evaporation Technique. Journal of Chemical and Pharmaceutical Research 4: 353-359. Hiremath SN, Raghavendra RK (2014) Dissolution enhancement of Gliclazide by preparation of inclusion complexes with ÃÂ-cyclodextrin. Asian Journal of Pharmaceutics.